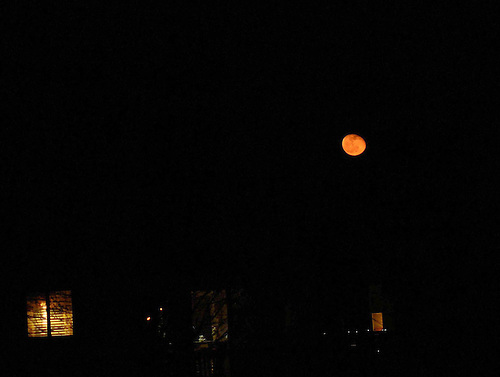 The moon was a bright ball of orange tonight. It added color and flavor to the darkness. It appeared all was quite until I noticed something was up in the neighborhood. What was going on? Your Story is a SethSnap series in which you get to decide the story behind the photo. You can write a story, a poem or even just one word. You decide. Put on your best capuchon, turn on your jazz song and laissez les bon temps rouler! To see previous Your Story posts click on “Story Time” on the right. Was it me or did you feel it too? Nothing, said Ashton, but he kept glancing back at the shadow of the moon. It was creeping him, he seemed someone called put to him from the sky..he could feel the presence of someone asking him to join him in the land…Jesus…where did that thought come from!! He turned around to find Sherry missing…He found her everywhere but could not trace her. Panic flooded inside him until he heard sounds of footsteps. He rushed there and saw Mark, Sherry’s brother walking towards him with a look of sorrow painted on his face. The four Indians gazed up at the sky; they were silent in their prayers to the great god Tonka who appeared in his orange armor. Tonka was welcomed by the Arapaho tribe; he signified good hunting and the hunters around the fire had waited for him to join in the hunt. Tonka was a strong hunter they had been told by their elders. His orange armor attracted the deer and caused the buffalo to calm enough for easy hunting. Yes, tomorrow would be a good day for the hunt. The hunters were happy! (hey, it’s 5 a.m. That’s the best my creative juices flow with only one cuppa!) Have a Happy Easter! You could write it in whatever language you feel comfortable in and we could google translate it. Orange you glad I’m here in the sky? Kissed by the sun to brighten the night! Sometimes I’m small, half or full! I’m always here with a smile for you! I have never seen anything like this before. It is absolutely beautiful. Reblogged this on Sanskrit Literary-Arts Magazine. It was a bit more on the lemon yellow side here, but only briefly. Nice. 🙂 The moon is always so amazing to look at. I’m a night owl, so I look for the moon every single night that it’s clear enough to see. I’m lucky to have both eastern and western views from my home, so I get to see it a lot. I love it in every stage. 🙂 It is amazing to look at! (Written in the form of a children’s story) For my little munchkin first, and now for all of you. & Seth, for being awesome with his beautiful photography. 🙂 Glad to add it to the lovely collection. Now I know why we are baking here downunder… the sun turned up the heat – we got scorched – all to make you an orange moon! This isn’t a story, but I was also looking at the moon on that night and marveling at the colour. I was out walking my dog and just had to keep staring at the orange moon. I felt like it was watching me, a big orange eye … ok well maybe that is a little story, after all! LOL. I used to think it was made of cheese, but after seeing this stunning photo I now believe it would be orange flavoured. True. 🙂 I bet it’s beautiful over NYC though. Over the neon signs promising ‘Idenities, 50% off’, the headlights glazing over a sticky highway, there was the sun’s frozen reflection, suspended in the air as the world waited to be bleached by daylight. Nice job. I am always trying to get a good photo of the moon. Love the images and the whole concept of your site, celebrating the natural world. It is truly amazing. I am staring out out a cold grey day in Nova Scotia. Spring is late coming but even at this there’s an awesome beauty in the inexorable movement of the waves on the stern immobility of the rocks. I want to visit Nova Scotia. It is always so beautiful in pictures.